Welcome! I’m going to assume that you are here because you’ve read Part 1 – (The primer) and are considered by anyone’s measure a binary black belt :D. If you’re asking yourself “huh.. what the funk is binary?” then you are not yet worthy greenhorn. Click here now. 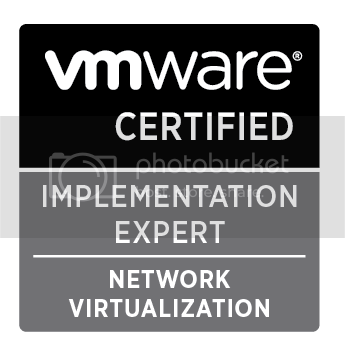 So moving forward… every IP address we deal with comes in a pair – IP and subnet mask. If the IP address is was the coordinates to a location – – the subnet mask might be the specific map. The purpose of the subnet mask is to identify the portion of the IP describes the network, and you can determine the part that is used to assign to PCs, Servers and Interfaces on network devices. One can be sort of significant without the other, but when you have the pair you are in business. If you open up your command prompt and run the ipconfig command , you will see your private IP assigned your router. In my home LAN, I was assigned IP address 192.168.0.56 with a subnet mask of 255.255.255.0. So what does that mean? when does subnetting happen? Hold your horses cowboy I’m getting there :D. Know that like in my home network, and in business networks, routers are the hard physical segmentation of a broadcast domain. Put this thought away for now though, we need to discuss IP further. The smileys are just there to help you process the ones.. they’re not significant. The notation /24 and the subnet 255.255.255.0 are absolutely and totally interchangeable. Some will call the notation /24 the prefix notation, the “slash notation” (yuck), or the CIDR notation… CIDR probably being the most popular, any is fine as long as you know what we’re talking about. I call it the prefix notation. The 255.255.255.0 is also a special subnet mask as it defines a “classful” class C network. Just so I don’t throw you off… know that classful networks using a classful subnet mask like 255.255.255.0 or /24 are what we have to work with if a subnetting technique is not applied. These are easy to remember, there are only three. To further analyze our home network example. My IP address 192.168.0.56 with the subnet mask 255.255.255.0 is a class C address and a single node that’s part of a bigger group. The subnet mask 255.255.255.0 lets me know that the first three numbers 192.168.0 identify the network. 192.168.0.0 First IP identifies the network segment – known as the network IP, the wire address. Not assignable.192.168.0.1 First usable IP address.. often assigned to the gateway, or routing interface. This one is assigned to my home router. 192.168.0.255 The broadcast IP address is the last IP of the network segment is also not assignable. For the sake of the concept let us only concern ourselves with a class C address for now. So at this point we need to understand that a network with prefix /24 or subnet mask of 255.255.255.0 represents a classful class C network, one that has 256 IP addresses total. 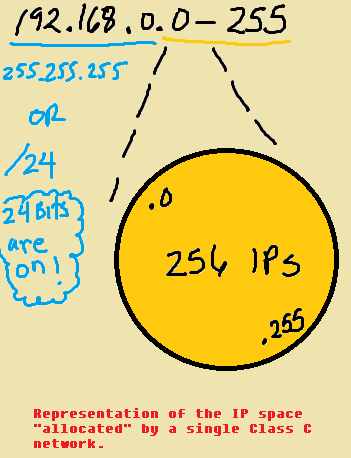 You can say that the range of IPs from 0 to 255 represents the full IP space. At this point, your noggin should hold a pretty rock solid idea of what the segment looks like BEFORE we apply subnetting. If you’ve fallen off the bus, go find yourself and meet us up here once you’ve caught up… otherwise I would find myself leading you into confusion. -100 IPs alloted to the users. -1 IP assigned to the Router1 Interface connected to Switch1. Enough for the rest of the network right? Well… actually not so fast Sancho Panza. The interface on Router1 delineates the physical end of the 192.168.0.0 /24 LAN. 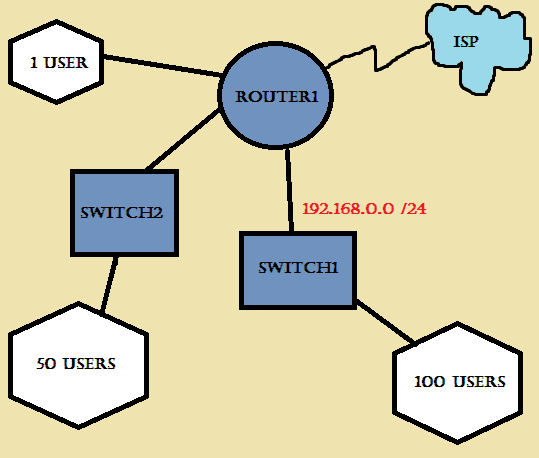 The 50 users connected to Switch2 cannot use the IPs allocated to the 192.168.0.0/24 network. You can solve this without subnetting by using the next available subnet 192.168.1.0 /24. This allocates another 256 IP addresses, of which only 254 are assignable. In this network segment 50 are assigned to users, 1 to the router interface, and 203 are left unused. Lastly – what about the single user directly attached to Router1 on the far left? You guessed it! You have to allocate yet another /24 network.. that means 254 more allocated IPs, and only 3 used (1 user, 1 wire, 1 broadcast). Anyone doing the math? When all is said and done, we’ve allocated 768 IP addresses for 151 users, 3 router interfaces and 6 required wire/broadcast IPs. Can anyone else see a problem with this? Designing networks using classful boundaries results in very large IP addressing inefficiencies. To mitigate this problem, RFC 1519 was written in September 1993 introducing subnetting and classless IP routing. RFCs are dense reading, they are very informative but can be confusing to someone trying to learn a concept. When you subnet an IP space you’re dividing the original IP space into distinct logical networks – each one with its own wire and broadcast address. This is accomplished by turning on additional bits on the classful subnet mask. I’ll wrap up this post with a small taste…enough to whet the appetite. Grats if you’re still following along, I realize it gets real ugly real quick. If you’re still on the bus please continue to Part 3. (Hopefully coming real soon :D) If you’ve fallen off, use this time to catch up or ask questions. Before we get into the meat of this critical matter of subnetting we have to cover a few bases. I want to move forward assuming you understand a few basic things. 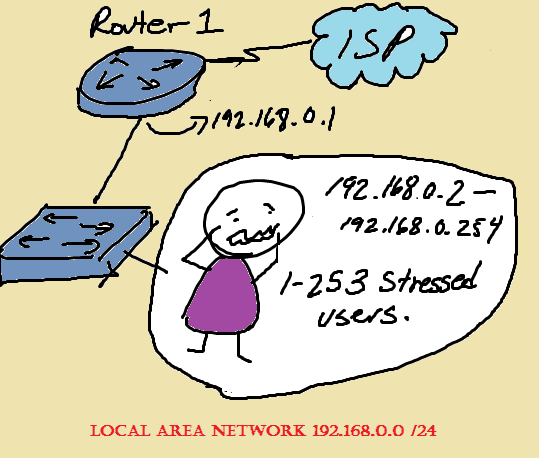 We’ll be dealing with IPv4 addresses, I will call them simply IP addresses… Although I am referring to IPv4 addresses. IPv6 (the one that looks like a MAC address) is out of scope in everything I write in this post. Audience: Those who don’t get subnetting but have a need to learn to subnet. ++ An IP address can be anything in the range of 0.0.0.0 and 255.255.255.255 , 0.0.256.0 is not a valid address. Why not 256? It cannot be represented in the 8 bits that compose the 3rd octet. You call the value between the periods “octets”. For IP 1.2.3.4 … 1 is in the 1st octet, 2 in the 2nd, 3 in the 3rd and 4 in the fourth. Each octet is composed of eight bits (bit locations, which could be on or off. _ _ _ _ _ _ _ _ . _ _ _ _ _ _ _ _. _ _ _ _ _ _ _ _. _ _ _ _ _ _ _ _ This is the 4 octects of an IP address represented by the bit locations, each underscore represents a bit location. There are 32 bits, 8+8+8+8. You MUST learn the powers of 2, this is elementary and absolute. 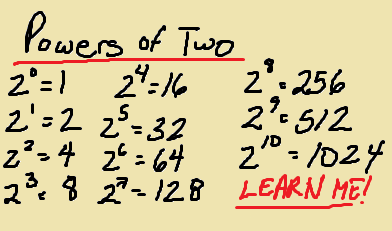 for the higher one it helps to remember that 2^10 to the tenth starts with 10. Every power is twice the previous one, or half of the next one.
. __ __ __ __ __ __ __ __ . The eight underscores of one octet (8 bits). You must absolutely without fail learn the value of each bit location. The left-most bit of an octet is worth 128, this is true for every octet. 128 64 32 16 8 4 2 1 <– These are the values of the specific bit locations. These values are the same for each bit location. Here’s a few examples of how you would represent decimal numbers in binary bits (of one octet). Learning to work with binary numbers (converting a regular decimal number to binary, and binary numbers back to decimal) is a fundamental skill for subnetting. This skilled must be honed through practice… try the cisco binary game. Play this game until you’re dreaming in binary. 🙂 You can download the binary game on your iPhone. A little bit of memorization here goes a long way. Memorize the additions of the bits from left to right. 192 224 240 248 248 252 254 255. Later it will make perfect sense why memorizing these additions is essential. Once you’ve committed these to memory, and are dominating the Cisco Binary game you can graduate to ‘How to subnet – Part 2’. As a bonus you can feel confident because no one in their right mind will call you a weaksauce binary noob. If they do – they are gravely mistaken. Look deep within your soul… if you feel are ready, click here for Part 2.